Give your loved one the gift of inspiration, education, and empowerment this holiday season! We love to read! There’s no denying that a good book can change your mood, spark an idea, inspire you to do be and do better, enhance your job or business, teach a new skill, and much more. In an ideal world, we’d love to read at least a couple of books a month. But we all know with our hectic lives, it’s virtually impossible to do it. It takes me at least a month and some to get through one book and that’s with lots of maneuvering (stealing moments to read during my lunch break, when the kiddos are in an activity (sports, dance, etc., after I’ve watched what they’re doing for a bit), before I go to sleep, pockets of free time over the weekend (we’re talking 30 mins here and there if I’m lucky.) You get the picture. It’s tough! So you can understand that when I get through a book, a juicy one at that, I can’t help but want to share it. Although I was unable to read as many books as I planned to this year, I’m grateful for the ones I was able to get through because they helped me escape the daily routine and stresses of life but most of all, inspired me to grow, to dream, to give, and to do and be better. Have a reader in your family or maybe you want to encourage your loved one to read? Here are 8 books from our gapmuse Bookshelf and gapmuseKids Bookshelf that are memorable holiday gifts for the readers in your family or friend circle. Whatever your perception of Michelle Obama as First Lady, scrap it because you’re in for a surprise! 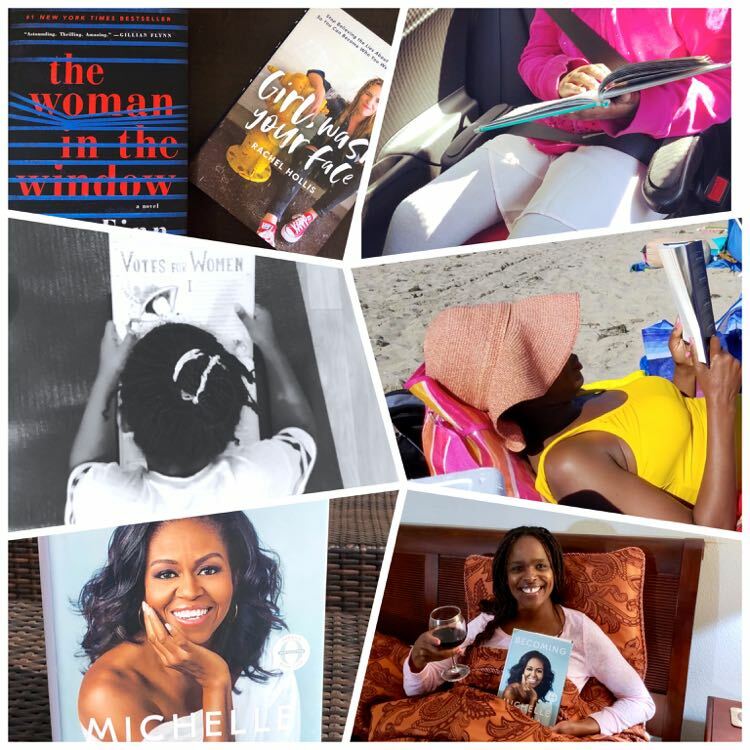 Michelle shares her story with unparalleled and unexpected honesty. Grab it as soon as you can because it will inspire you beyond your imagination. You will come away realizing we’re more alike than we’re different; you’re responsible for who you become; you’re allowed to shape your destiny; you should never judge others for the way they are unless you know their story; you can thrive despite your background, and much more. Please look out for our post summarizing our key takeaways from the book and book tour, which I’m lucky to be attending in a couple of weeks. This book is a joy to read and quite frankly a great gift for any woman out there! Whether you’re a working mom (stay at home moms are working moms too), single, married, or young, it’s packed with wisdom delivered in a humorous presentation. It highlights what it takes to be a hustler and to find success whether you’re college educated or not. Rachel Hollis is the real deal; the epitome of a hard-working, no-nonsense entrepreneur, mom, spouse, and woman. She includes invaluable tips on how she accomplished her goals at the end of every chapter. They’re so good and relatable I had to share with my teen! Plus I loved the book so much, I gifted it to a couple of my good friends because I couldn’t imagine keeping it to myself. Do the same for a friend or family member you know would enjoy it too. This book should be required reading for every teen girl and boy! Who’d have known when reading it a year ago, it would remain relevant to my everyday life as recently as last month. Funny story, in early November, my teen daughter (14) asked me if I knew the meaning of feminism. The question threw me off at first because she knows I’m a feminist. I mean, how could she not know, I was thinking. But as a mom, I wanted to understand where she was going with it so I rolled with it. I explained, “Feminism is the fight to be treated equally despite your gender.” I proceed to cite some examples to drive the definition home; If you’re doing the same job as a man and have similar qualifications, you should get the same pay; If you’re applying for a loan and meet the same requirements as a man, you should get the loan at the same rate; you should have the right to choose, you should have control over your body, etc. Her response, “Oh good, because there are some women out there who believe feminism is hating men.” Asking that question was a test to find out what it meant to me. Her “oh good” was a sign of relief that I didn’t aspire to this definition. Come to find out also that the question was sparked by my enthusiasm about going to watch “Widows” over the Thanksgiving holiday, a movie with a cast of badass women in a heist plot. She was thrown off by my excitement (I’ve been known to be over-exuberant at times!) and thought it might have been too much. Don’t you just love children’s honesty! I suppose she had noticed a pattern of this excitement whenever something was happening that showcased women at their best. Looking for a conversation starter with your child? Search no further than this beautifully told and illustrated book. Plus, it’s the gift that keeps on giving. My little one now speaks about Marie Curie, Freda Kahlo, Amelia Earhart, Anne Frank, Rosa Parks, and more phenomenal women featured in the book so casually, as though she’s known them for all of her 8-year-old life. It’s has been so compelling to her that in our past 2 visits to the library to pick up some books, she has asked to check out biographies of Marie Curie, Amelia Earhart, and Freda Kahlo! It’s the coolest thing ever! 5. Untangled: Guiding Teenage Girls Through The Seven Transitions into Adulthood by Lisa Damour, Ph.D.
Have a teenage girl in your house? You need this book! It has been a life saver for me and really helped me understand the inner workings of the brain and behavior of a teenage girl. It has given me the tools to handle the changes my daughter is going through with much more understanding and grace. I’m still making some mistakes (hey, I’m human!) but they’re fewer than before I read the book. The perfect gift for teen moms! Here’s another superb conversation starter with your child. We can all agree that there are few books out there celebrating the achievements of women of color, especially, black women. Imagine my glee when I discovered this gem from an episode of one of my favorite comics, Trevor Noah. Vashti Harrison has managed to capture the stories of these 40 notable and unforgettable women in an easy, digestible, but compelling way for kids and adults alike. Though possible, It is harder to aspire to something you cannot see. This is a great book not only for all girls but especially for girls and young women of color. There is much joy when your little one asks to learn more about Nina Simone. You go to Youtube together, pull up a Nina Simone song and watch while she’s awed by this amazing singer, songwriter, and amazing pianist. It’s even more delightful when out of the blue while she’s wondering what song to play, she searches for and finds Nina on her own! From Nina Simone, Josephine Baker, Harriet Tubman, and Maya Angelou, to Florence Joyner, Audre Lorde, Althea Gibson, Dr. Mae Jeminson, and more, this little book is packed with black women scientists, artists, activists, doctors, musicians, Olympians, and more. It includes more than enough amazing women to empower your child to dream and dream big! This was by far one of the most eye-opening books about women and the workplace. It’ll give you a fresh perspective on how to manage your career trajectory with realistic expectations (read: there’s no such thing as having it all or being able to lean in without having the adequate support from your partner, spouse, family, extended family, organizations, and community.) We must stop giving women the illusion it’s possible to achieve everything they want if they somehow figure out how to find balance. Your economic background, family structure, race, gender, education level, and networks all impact your career and how you fair in the workplace. These factors have to be taken into consideration whenever we tell women to lean in. A worthy read! I started reading this wonderful book by A. J. Finn a couple of weeks ago and I’m fascinated by the story. It’s taking me a little longer because I’m reading Becoming by Michelle Obama at the same time, and I’m about to start reading Crossing the Chasm by Geoffrey A. Moore. Yes, I read multiple books at the same time, which partly explains why it often times takes so long to get through one! This New York Times bestselling and artfully written thriller is the perfect escape from your daily routine and a great read for the holidays. Can’t wait to get through it! Want more book gift ideas for the holidays? We hope these memorable books will help you with your Holiday gift giving. Have any books you want to share with our readers, please share? We love to discover new books to educate, inspire, and empower us.